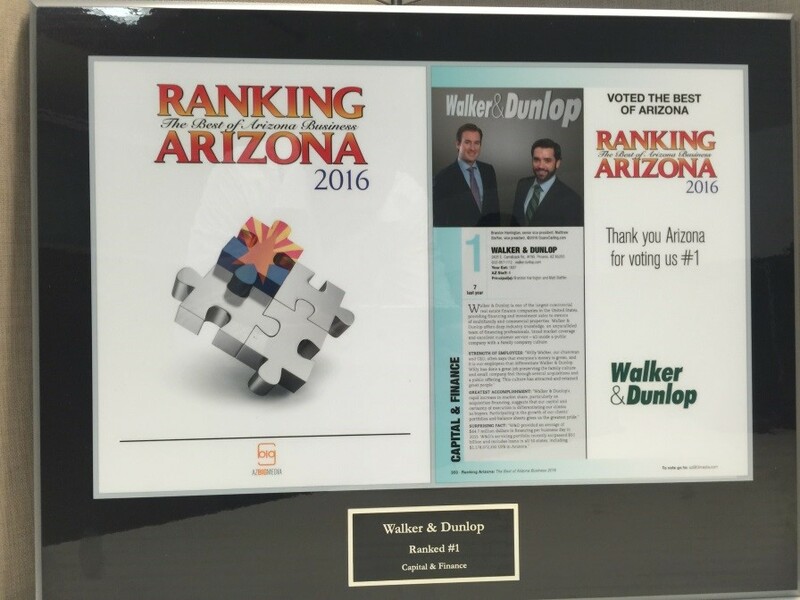 Walker & Dunlop, Inc. (NYSE: WD) (the “Company”) announced today it was the top-ranked firm by Ranking Arizona 2016: The Best of Arizona Business. This award recognizes companies within the local community based on the quality of the product, overall service, and staff. Competition included more than 20,000 businesses in 200 different business and leisure subcategories. In 2015, Walker & Dunlop ranked seventh for this award. The Arizona team comprised of, Brandon Harrington, senior vice president, and Matt Steffen, vice president, focuses on multifamily financing throughout the southwest region and closed more than 30 loans throughout 2015. Walker & Dunlop provided an average of $64.7 million in financing per business day in 2015 company-wide and the firm’s servicing portfolio recently surpassed $50 billion. Walker & Dunlop’s financing professionals provide each client with distinctive financing solutions to meet their requirements. It is through this commitment that year after year, clients return to the Company for their financing needs.